Joy Creek Photo Archive (c) all rights reserved Saxifraga paniculata is found mostly in Europe but this selection of the species is from the North American population which was once thought to be a separate species. 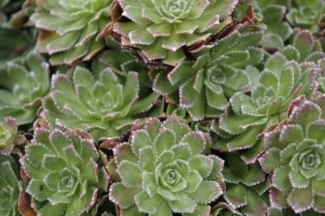 Measuring less than 2 inches in width, the evergreen rosettes are lime-encrusted along their margins. Leaf-margins are lightly toothed. Although the narrow leaves of this species are said to be blunt at the tip, our form is rounded and comes to a pointed tip. The flowering stems vary in height from 3 to 12 inches. We grow this in a shallow container with an inch-layer of 1/4-inch gravel. Early summer. 1 in. x 8-10 in.